Real recipes, real food, real memories. A mother paints a picture of her life with unforgettable, daily recipes. Heath bars have an interesting history. According to on-line sources, they were packed in the K-rations during WWII as a treat for the military personnel. Apparently, these chocolate-coated toffee bars had a long shelf-life which added to their importance as a food source for the military. In most households, however, a long shelf-life is not much of a problem where candy is concerned; if anything, candy gets eaten up too quickly. While I try to keep my sugar intake down to a minimum, certain times of the year, I do indulge in homemade sweets like cream caramels, (post # 215 ) and the chocolate-toffee almond candy below. The taste combination that the Heath company came up with so many years ago, was well thought out. All the flavors are great together. 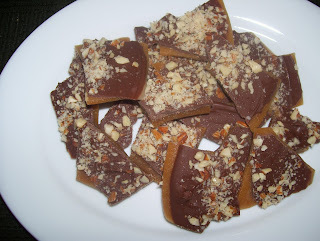 This easy recipe turns out a sweet, crunchy toffee that is fun to eat and to share. Heat butter until melted; stir in sugar, water and corn syrup. Cook until mixture reads 290 degrees (soft crack stage). (This candy cooks up quickly...watch thermometer carefully). Pour onto well greased cookie sheet and let mixture spread out, (you may tilt the pan slightly to have mixture spread thinly). Allow toffee to cool for ½ minute. Arrange chocolate top of hot toffee; as chocolate melts, spread it evenly over candy. 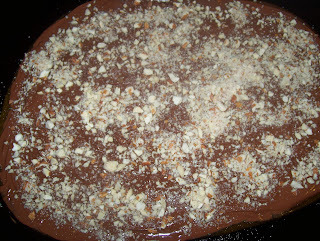 Top with nuts and press them gently into chocolate. Chill until chocolate is set. Break into small pieces. Store in a covered container. I am married, have four children, three step-children and many grandchildren. Over the years, various pets have lived in our home; some more wonderful than others...dogs, a cat, birds, fish and frogs. I also owned two miniature donkeys and a very special horse named Sage, who is a therapy horse in Park City, UT. Aside from my love of animals and teaching, cooking has always occupied my life. I love the thought of creating and experimenting with food. It was and is the process that brought our family together. 242. Coconut Rice with Lemon Grass, Wonderful!